Trees cut along expressway near Savin HillA state brush clearing project along the Southeast Expressway (I-93) in Savin Hill has upset some resident who worry that the landscaping has left the neighborhood more exposed to noise from the highway— and just looks ugly. “There would be some long-term concerns that these [sumac trees] could take root and affect concrete retaining walls and abutments, but any negative impacts as a result of the growth would be a long ways off. But ultimately, our plan is to remove this to be able to better maintain it before any of those issues occur,” Verseckes wrote in an statement to the Reporter. 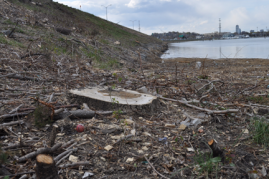 Doreen Miller — a resident of Savin Hill for over 50 years — said that the brush clearing has destroyed a beautiful area along the expressway on the water side of Freeport Street. Miller worries that the absence of trees will heighten the already elevated noise levels from passing traffic. “It breaks my heart every time I drive down the boulevard and see such wanton and reckless destruction of what were healthy trees that included pines, oaks and maples. The noise is a definite stress factor that has now been increased substantially,” Miller wrote in an email. MassDOT plans to plant grass to prevent erosion and make it easier to maintain the area. “The goal is to remove all that [sumac], plant grass to help it anchor everything into place, and make it easier to pick up litter,” said Verseckes. John Freeman, a South Boston resident who has spent most of his working days in Dorchester doing home repairs for the past 18 years, said he first noticed the clearing done by MassDOT crews a couple of weeks ago. Freeman said that he believes in maintenance and replacement rather than the clearing of trees. “I believe if you take things down, you should put them back up. Cut back overgrown trees, or cut them down if you have to, but replant new ones,” said Freeman. Rep. Marty Walsh (D-Dorchester) said that although he doesn’t believe that the trees and shrubs provided an effective sound barrier, he is very concerned about the effect of the clearing on neighborhood appearance. He plans to work with MassDOT to allay community members concerns about the impact on neighborhood aesthetics. “I’m going to make sure they put something back there. I will be seeing if they can plant some type of wildflowers by the highway to make the appearance look good,” said Walsh. As this project continues, there will appear to be gaps in the brush clearing along the expressway. These spots, generally adjacent to people’s homes, will be returned to in the spring or summer. MassDOT will be utilizing laborers over machines in order to lessen the neighborhood impact, by using a “lighter touch,” Verseckes said. “In all likelihood, we won’t have the heavy machinery out there now — we’ll be out there with more manpower and less equipment so as not to be a major disturbance,” Verseckes said.